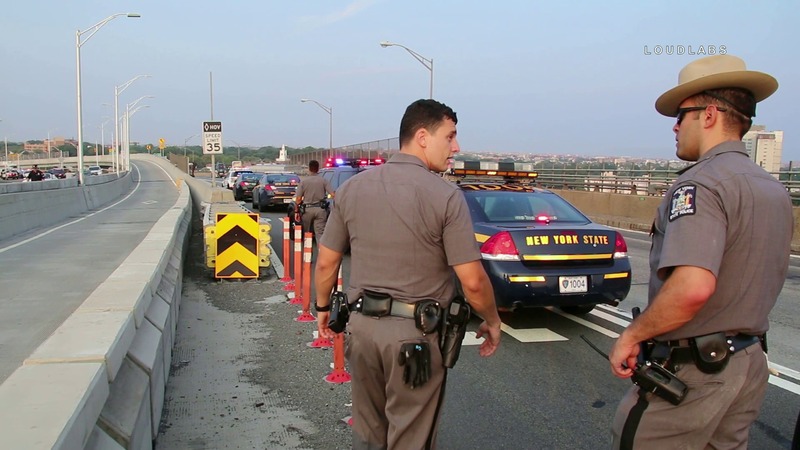 VERRAZZANO BRIDGE, Brooklyn-side – A vehicle pursuit that started in Staten Island progressed against traffic on the upper level of the Verrazano Bridge Monday around 5:30 pm. An unmarked anti-crime 122 precinct unit collided head-on with a white van driving against traffic driven by the Perp. The perp fled the van on foot, was pursued by police, and arrested by the Triborough Bridge and Tunnel Authority police. Perp was transported to Staten Island University hospital in unknown condition. Two officers suffered from injuries including a laceration to the face and a back injury. Both were transported to Staten Island University Hospital in stable condition. Upper-level Staten Island-bound traffic was delayed while the incident was ongoing.